The Aressana combines tradition with sophistication and family hospitality with professional service, guaranteed to satisfy the most discerning guest. Designed as a quiet heaven, the atmosphere at the Aressana Spa Hotel & Suites is relaxed and calm. The variety of geometric forms and design found on various levels have created hideaways for reading, writing, relaxing with friends, or simply soaking up the culture of this amazing Greek island. 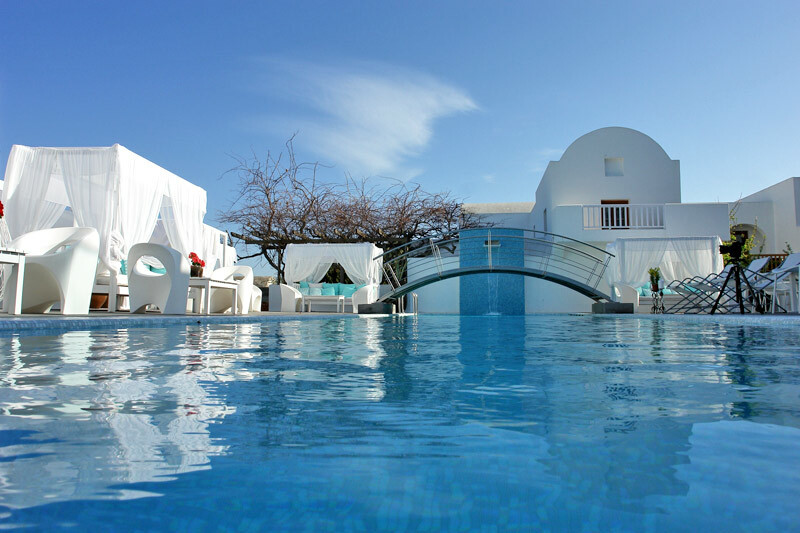 Centrally located in the original part of Fira, in a quiet corner of this lively town, between the Greek Orthodox cathedral and the unique Museum of Prehistoric Thera, it is in walking distance of restaurants, boutiques, galleries and the exciting nightlife. Literally a few steps beyond the hotel entrance is the caldera rim, offering magnificent views of the cliff face and the volcano, especially at sunset. All the rooms of Aressana have a small terrace outside with a table and chairs-perfect for you to enjoy the Greek sun. The Double Garden Level Rooms: Most of these rooms are located on the lower level of the hotel, one flight of stairs down from the Lobby and provide a quiet restful accommodation. Approx. 17m2, modern decoration, equipped with furnished outdoor patio or terrace are the ideal environment for relaxing. Room comprises bedroom with 2 twin beds or a king size bed, private bathroom with bathtub or shower. The Double First Floor Rooms: Most of these rooms are situated on the upper level of the hotel, one floor higher than the garden level double rooms which is on the same level as the Lobby. They are all spread around the first floor complex with modern decorations, and all open out onto private furnished balconies. Many rooms feature views of the East side of the island towards the sunrise or have garden views and few face the swimming pool area. Some are privileged of having the traditional round high ceiling. Approx. 17m2, room comprises bedroom with 2 twin beds or a king size bed, private bathroom with bathtub, private balcony perfect to rest and play. Suite Garden Level: Comprising of two areas including one bathroom, one bedroom with 2 twin beds or a king size bed and a sitting room with a pull-out sofa bed, on which a third and fourth person can sleep comfortably. The room is separated either by a door in the middle or an archway (open-plan style) and makes this accommodation ideal for family breaks. Furnished patios provide lush and green garden views and tranquil relaxation. Approx 30m2, situated on the Lower Level, one flight of steps down from the Lobby. Not recommended for 2 separate couples due to limited privacy and bedding set-up. The Upper Floor Suites: Due to their location within the hotel and special features, these rooms are considered two of the best rooms that our hotel offers. Approx. 30 m2, situated on the highest Upper Level, one flight of steps up from the Lobby. Upper Floor Suite #26: Comprising of two areas including one bedroom with 2 twin beds or a king size bed and one sitting room with a pull-out sofa bed, on which a third and fourth person can sleep comfortably. Spacious accommodation having both room areas leading to a private balcony. Balcony offer views of the East side of the island with a distant sea view towards the sunrise, Fira town and the hotel’s pool area from up high. Bathroom equipped with Jacuzzi style bathtub. Upper Floor Suite #24: A supreme room of one large open space with a lovely sitting area and a romantic in-room black egg-shaped bathtub for two inside the room. This room has a remote controlled retractable open roof above the bed for sleeping under the stars at night and a small balcony above the hotel’s entrance. Partial view of the sea can be seen towards the sunset. Bathroom equipped with a large walk in shower. The Suites Jacuzzi Upper Floor: Due to their location within the hotel and special features, these rooms are considered two of the best rooms that our hotel offer and perfect for the couple or friends with a special occasion to celebrate. Approx. 30 m2, situated on the highest Upper Level, one flight of steps up from the Lobby. Children up to the age of 2 and baby cot are free of charge.